Due to scientific advances being made after these studies were published my survey of AncestryDNA results also benefits from a finer scaled within-Africa resolution: 9 African regions or ancestral clusters being distinguished (see also AncestryDNA Regions). Even when a most recent study, Montinaro et al. (2015), on first sight seems to include an impressive number of 33 (sic!) African clusters, its African dataset is still basically the same as used in studies dating from 2009/2010. Featuring only Mandenka and Yoruba samples to cover the whole of West Africa. Arguably its regional within-Africa analysis therefore might also be considered “outdated” when compared with the one provided by Ancestry.com. See also this press release: AncestryDNA Makes Scientific Breakthrough in West African Ethnicity. In addition the genotyping performed by Ancestry.com is based on a solid 690.000 SNP’s (see http://isogg.org/ for reference). The Cape Verdean sample group includes family origins from across the islands. However results from the most populous island Santiago are underrepresented while those for Brava are overrepresented. The Dominican results are largely from persons originating from the socalled Cibao area, in the north of the Dominican Republic. Other parts of the island are underrepresented. The Mexican results were preselected for showing atleast a minimal amount of African ancestry in order to fulfill the criteria of my survey. Still almost all of them are only of very minor African descent (<10%). The Puerto Rican results are likewise mostly skewed to people of minor African descent (<25%). However as described in more detail on this page, it seems quite likely that there could be substructure in the regional African origins of Puerto Ricans correlating with their degree of total African ancestry. The regional patterns for Puerto Ricans of predominant African descent possibly being substantially different. On this page i will however only take into consideration the averages for the entire sample group. Lower Guinea covers the Gold Coast and Bights of Benin/Biafra; and seems to correspond with the “Ivory Coast/Ghana”, “Benin/Togo”, and “Nigeria” regions on AncestryDNA as well as the Kwa and Volta-Niger languages distribution (depicted in orange in the map on the right). The Gur and Kru language groups being somewhat intermediate perhaps. Central Africa would include both West-Central Africa proper as well as Southeast Africa (depicted by Angola, DRC and Mozambique in the map to the left below, but actually also including other neighbouring countries); this biggest zone seems to correspond with “Cameroon/Congo” as well as “Southeastern Bantu” and the Bantu speaking area in general (depicted in pink in the map to the right). It is very likely however that the AncestryDNA regions might have different ethnic implications for each nationality. Furthermore, despite being a pioneering effort and providing much regional detail, there is a conspicuous absence of separate regions for Sierra Leone as well as Angola in the present version of AncestryDNA. This is understandably because of a lack of adequate sampling. Nevertheless these countries are crucial places of origin for many Afro-Diasporeans and it might distort the Ethnicity Estimates or interpretation thereof. It should be clear by now that there are several limitations to the data i have collected. It is not my intention to present my sample groups as perfectly representative of any fictional national averages. Even so i believe the results hold very valuable information in themselves. The current data for the seven nationalities featured on this page already seems robust enough to at least indicate a basic regional framework. Especially for African Americans. As in fact their regional ranking patterns from my survey appear to be nearly the same as the ones which can be verified using Ancestry’s much larger client database (see “Genetic Census of America” and section 5 of this page). To conclude this introduction i like to emphasize my survey consists first of all out of individual results reflecting unique family trees. In my analysis however i will be focusing on the group averages to get a better grip on the underlying patterns. Even when the proverbial exceptions to the rule could in fact be one of the main patterns. It is of course inevitable that with more testresults available, also from other nationalities, you will see additional and different regional patterns showing up. It is especially regrettable that I did not have any more Brazilian and Cuban results to analyze as they might provide an insightful contrast to the other results in my survey. I will now proceed with discussing the main patterns I am able to pick up from the data. Of course merely expressing my personal opinions & thoughts and not meant to be conclusive in any way. This report was first published in May 2016. Two years later I blogged about my updated survey findings, incl 45. 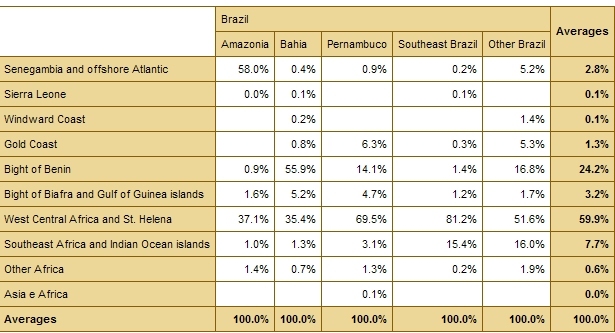 Brazilian ancestryDNA results. To enable group comparison i have scaled everyone’s African breakdown to 100% but obviously to put everything in broader perspective the original total African amounts are also still relevant. This kind of data often gets presented in a potentially misleading manner. Only highlighting the mathematical mean of all the results as the average. Which tends to downplay individual variation and obscure possibly skewed distributions. Therefore I have compiled various other statistical measures in the chart above. Because several of my sample groups seem to have an asymmetrical data distribution i have decided to use the median (50% cut-off point of all observations) to represent the group averages instead of the mean. In the following charts below the median scores will be denoted as “Total African”. Given the sampling bias already described above and also because of the disproportional statistical influence of several outliers i will repeat: no fictional national averages are intended. The percentages firstmost reflect the sample groups which were available to me. Follow this link for the source data. As can be verified from the chart above “Africa North” scores are usually only detectable above trace level for Hispanic Americans and Cape Verdeans. Furthermore they seem to be negatively correlated with total African ancestry. In other words people of minor African descent will usually score more noticeable “Africa North” amounts. As i am scaling everyone’s African breakdown to 100% the North African proportions might therefore appear inflated for people with little African ancestry otherwise, especially for Mexicans and Puerto Ricans. Based on the original percentages as reported by AncestryDNA, the average “Africa North” scores are however quite minor. The highest score i have seen for this region being 10% (for a Puerto Rican). This socalled “Africa North” region seems to be primarily suggestive of colonial Iberian connections by way of the Canaries (¡Guanches!) or Moriscos or perhaps even dating from prehistorical times (see references at the end of this article). In addition a West African explanation (by way of the Sahel region) could still also be possible, especially for Cape Verdeans and non-Hispanics (see section 4 of this page for more detailed discussion). Either way, in the remaining part of this page i will exclude “Africa North” from my analysis in order to enable a more evenhanded comparison between African Americans and West Indians with Hispanic Americans and Cape Verdeans. This third chart features an additional breakdown of my own making into 3 greater African zones: “Upper Guinea”, “Lower Guinea” and “Central Africa”. 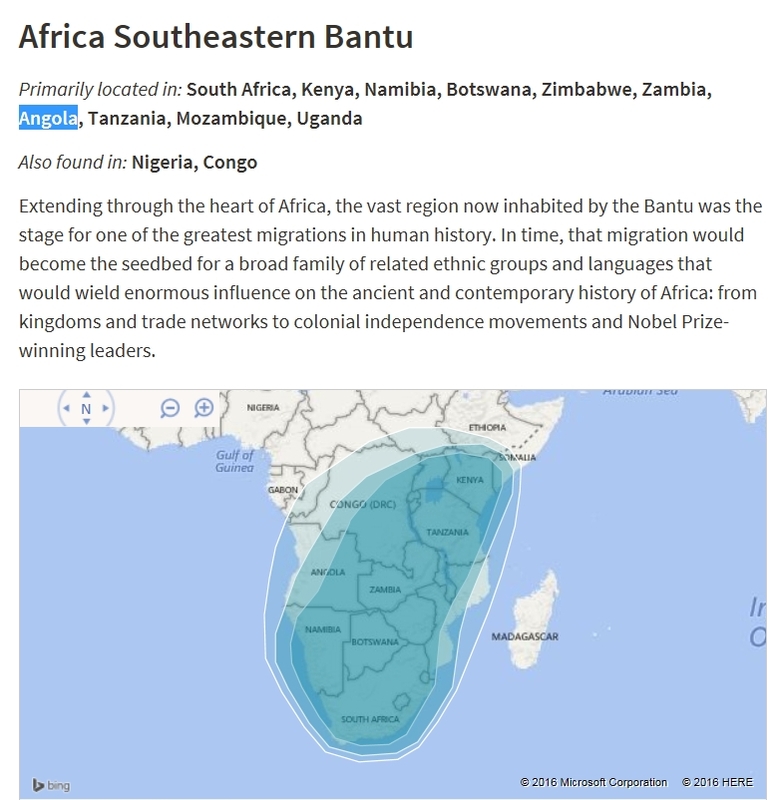 Bantu speaking ancestry from Southeast Africa also to be included in “Central Africa”. In order to get a strictly “SSA” (Sub Saharan African) comparison i have excluded the region “Africa North” and corrected the other averages accordingly. Making this 3-way distinction is admittedly arbitrary and can only produce a rough proxy, given the limitations of AncestryDNA. Especially the regions “Mali”, “Ivory Coast/Ghana” and most of all “Cameroon/Congo” can be expected to show overlap between neighbouring zones. Still I find this distinction useful because it allows certain regional patterns to show up more clearly and it conforms with common nomenclature in slave trade literature. For ethnolinguistical and historical maps from these 3 main regions of provenance see: Upper Guinea, Lower Guinea, Central Africa. These piecharts above show the frequency of each African region (except “Africa North”) being reported as having the highest amount in the African breakdown for each of the seven nationalities under study on this page. In addition also 8 Nigerians (all either Igbo or Yoruba) results are included as an African control group together with the 40 Cape Verdeans. This frequency of regions being ranked #1 is perhaps the best indicator of which distinct African lineages may have been preserved the most among my sample groups.The charts should be interpreted carefully however because hypothetically if a region is consistently ranked second place among one of my sample groups it will not be mentioned. Even when its group average might still be considerable. The charts therefore represent an extra pronounced measure to bring forward some of the regional patterns more clearly. The picture that is emerging is still preliminary because of limited sample size. But it might very well be suggestive of which regional African lineages are likely to be relatively the least diluted in the genepools of each separate nationality. Within my spreadsheet i have created a column named “∑ Top 2” which features the sum of the two biggest African regional scores for each individual result. Combining the shares of the two main regions provides a rough measure of how homogeneous or rather heterogeneous a person’s African breakdown might be. The chart above shows the averages of these combined top 2 regional shares per nationality. I also included the average of 8 Nigerian results as a benchmark of some sorts. Reviewing all the AncestryDNA results from my survey one immediate observation comes to mind: nearly all Afro-Diasporeans show thoroughly mixed and individually variable African regional breakdowns. Depending on total amounts of African ancestry, usually 2 up to 6 main regions are being reported with considerable percentages each and in all sorts of combinations. In addition several trace regions are almost always also reported. Some results even feature all 9 African AncestryDNA regions available! Running the whole gamut from “Senegal” to “Southeastern Bantu”. This also occurs for people with only minor amounts of total African ancestry. Only few persons and even fewer nationalities are showing a clear and consistent pull towards just one single predominant African region (>50% of total African). It is even more rare to observe an absolute majority (50%+) of someone’s entire ancestry consisting of just one single African region. Among the 707 persons in my survey this occured only 11 times. In other words only 1,5% of the entire samplegroup obtained a score of 50% or higher for just one single African region2! This major outcome seems to argue against the sometimes all too easy generalization being made that Afro-Diasporeans can trace back most if not all their African roots to just one particular place or just one single ethnic group. Instead a composite of thoroughly blended African ethnic origins for most Afro-descendants seems more plausible and is also confirmed by these findings. Tracing back the African-born ancestors of Afro-descendants will usually take you back several centuries. Leading to dozens or even hundreds of African-born ancestors from various areas across Western and Central Africa, and to some minor degree also from Southeast Africa. Naturally across the generations these ancestors would intermingle and have regionally “mixed” (within-Africa) offspring. Eventually resulting in the highly intricate and varied AncestryDNA results of their currentday descendants. From all the nationalities in my survey only Cape Verdeans show a predominant proportion of their African DNA coming from just one region (“Senegal”). As can be verified from their average “Senegal” scores (58.7% when “Africa North” is excluded). Also “Senegal” is almost consistently being ranked #1 in their results (36/40). Combining the average scores for “Senegal” with “Mali” this AncestryDNA analysis seems to confirm for the first time (afaik) that Cape Verdeans are overwhelmingly (~75%) of Upper Guinean origins according to autosomal genetics (see chart 2.3). Previous haplogroup studies have also come to the same conclusion, however they were restricted in the sense that they did not measure the complete, genomewide ancestry of Cape Verdeans but only focused on maternal lineages3. The various charts shown above seem to suggest a great deal of shared regional ancestry within Africa across the Diaspora. Even though the underlying ethnic origins are likely to show more differentiation. No single AncestryDNA region is “exclusive” to any nationality. All of the nine African regions are conceivable to appear in individual results regardless of nationality, even if only as a minor trace region. The average regional composition for each nationality will be distinguishable therefore because of its regional proportions but not per se its constituent regions. And indeed when looking at the regional group averages, the additional breakdown in three greater zones and especially the frequency of #1 rankings some characteristical tendencies for each sample group may already be distinguished. These distinctive regional profiles seemingly tied to specific nationalities will be discussed in more detail further below. Still it is possible that people of two different nationalities but with the same total African amount will obtain the exact same African breakdown or nearly so. Also for individuals of two different nationalities and with different levels of total African ancestry the regional scores in their African breakdown might still come very close, both proportionally speaking and in ranking (see section 5 for several examples). Implying that in individual cases it will actually be the non-African regions which might prove to be most useful to identify each separate Afro-descended group based on their DNA results. Generally speaking Hispanic results are easily singled out because they will be showing high levels of Amerindian ancestry. An ancestral component mostly absent or reported at tracelevel for my other sample groups. In this way even Puerto Ricans and Dominicans of higher than average African descent (50%-78%) can be distinguished. Furthermore African Americans and Jamaicans will usually receive Northern/Western European regions in first place instead of “Iberian Peninsula” or “Italy/Greece”. Haitians being somewhat intermediate in this regard. Several Jamaicans are also showing either “South Asian” or “East Asian” admixture in substantial degree. While for Cape Verdeans a significant amount of “Middle Eastern” or “European Jewish” is often reported, although they share this aspect with many Hispanics. One of the most intriguing outcomes of this AncestryDNA survey for me personally was seeing the genetic legacy from the earliest victims of the Trans Atlantic Slave Trade (1500’s/1600’s) being confirmed. Many of these persons arrived in the Hispanic Americas from the Upper Guinea region (Senegal, Gambia, Guinea Bissau/Conakry and Sierra Leone), often by way of Cape Verde (see also this page). We can verify their “founding effect” by reviewing chart 2.3. The combined average scores of “Senegal” and “Mali”, together forming the Upper Guinea area, are significantly higher for all Hispanic nationalities when compared with African Americans. 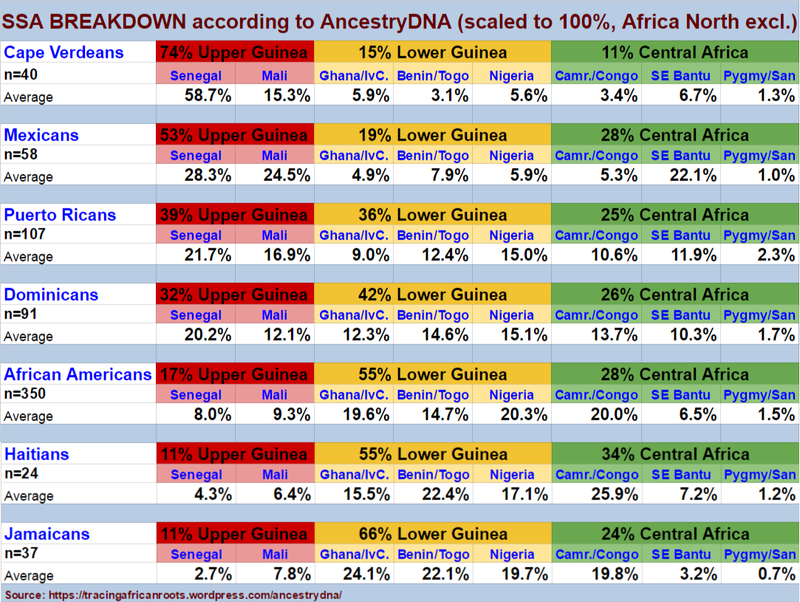 For my Mexican samplegroup Upper Guinea would even make up a small majority (53%) of their African breakdown. While for Puerto Ricans (39%) and Dominicans (32%) it represents close to or over a third of their African origins according to their average AncestryDNA results. These percentages clearly exceed the 17% for my African American samples and even more so the 11% for my Jamaican and Haitian samples. This goes especially for “Senegal” which peaks for my Cape Verdean samples, corroborating its ultimate Upper Guinean origins. The average scores for this region among my Hispanic samples being twice or even three times greater than the African American average of 8%. Given this growing amount of DNA evidence it seems the assumed prominence of Senegambian ancestry among African Americans is up for reconsideration. Upper Guinea is often proposed as one of the biggest “homelands” for African Americans based on historical documentation. And to be sure African American AncestryDNA results do indeed confirm the widespread existence of these lineages. Still judging from the average amounts being reported for “Mali” and especially “Senegal”, Upper Guinean origins on average do appear to be more diluted and subdued than expected. This also includes results from Louisiana for whom the Inter-Colonial and Domestic Slave Trade is often underestimated when considering their roots within Africa. The exact degree of Senegambian origins and any possible reasons for its relative greater dilution among African Americans are yet to be determined. But at any rate the often made assertion that African Americans would have the greatest proportional share of Upper Guinean ancestry within the Americas may no longer be tenable. It might very well have to be rephrased into African Americans have a greater share of Senegambian ancestry only when compared to the English speaking West Indies and Haiti but not so when compared with the Hispanic Caribbean and Mexico/Central America4. The persistant Upper Guinean genetic imprint among many Hispanics, often dating already from the 1500’s/1600’s can no longer be ignored. ” In the United States, African mothers were reasonably likely to be Igbo or Wolof: a thesis that can eventually be tested through DNA studies” (Slavery and African Ethnicities in the Americas: Restoring the Links (Hall, p.142, 2005). When looking at the combined scores of “Ivory Coast/Ghana”, “Benin/Togo” and “Nigeria”, the Jamaicans results in my survey most convincingly reflect a prevalence of origins from within the wider area inbetween Liberia and Cameroon, a.k.a. Lower Guinea. Most people will already be aware that West Africa provided the bulk of African captives to Jamaica. But making this further regional distinction within a comparative framework does provide additional insight. It is a genetic confirmation of what has been historically documented and culturally inherited for not only Jamaicans but English speaking West Indians in general. Especially ancestral connections to both Ghana and Nigeria are proven to be paramount. These connections are of course in no way unique or exclusive to Jamaica but it might be said that the regional preponderance of the socalled Lower Guinea area makes Jamaican DNA profiles appear more distinct, when compared with the other 6 nationalities in my survey. In the same manner that the Cape Verdean AncestryDNA results show a clear predominance of Upper Guinean regions (74%), my Jamaican samples are almost 70% Lower Guinean (see chart 2.3). While for the other nationalities a more regionally balanced composition is obtained. Haitians (55%) and African Americans (55%) are showing only a slight majority of Lower Guinean regions. While for Dominicans Lower Guinea provided the biggest share (42%) but not a clear majority. Lower Guinean regions were at their lowest level for Cape Verdeans (15%), perhaps in part suggestive of Sierra Leonean origins but otherwise mostly reflecting Trace Regions with reduced reliability. None of my sample groups however came out as being predominantly “Central African”, on average. Not even the Haitians. Although they do score the highest for this regional zone as expected when going by the Slave Voyages Database. According to documented sources nearly 50% of all Trans Atlantic voyages to Haiti , excl. Inter-Caribbean ones, are said to have originated in Central Africa (also incl. 3.3% from Southeast Africa). Instead about a third (34%) of the African composition of my Haitian samples taken together can be said to suggest Central African origins, specifically from Congo. An impressive proportion but trumped by the 55% for Lower Guinea, especially suggestive of Benin and Nigerian orgins. 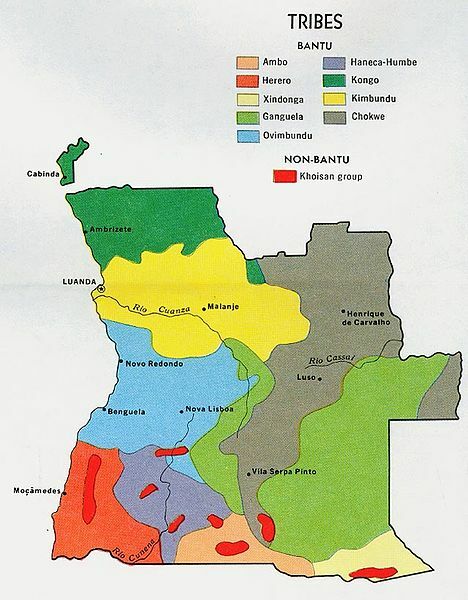 Still several individual Haitian results do display a majority of Central African regions, combining “Cameroon/Congo” with “Southeastern Bantu”. Most likely such outcomes will be obtained in higher frequency for Haitians than among other nationalities, when greater sample groups are available. In accordance with known slave trade records. Even when in fact i have also seen quite a few African American individuals who seem to be of predominantly Central African descent (>50%). And also already a couple of Jamaicans who range in between 40-50%. As a caveat it should be pointed out though that also Bight of Biafra connections might be included in the “Cameroon/Congo” scores. The Central African contribution can also be very pronounced for many Hispanic persons, even if only relatively speaking within their usually minor total African amounts. Intriguingly the “Southeastern Bantu” region is often showing up in greater amounts than the “Cameroon/Congo” region. Which stands in contrast with the results of most African Americans, Jamaicans and Haitians. It looks like a good case can be made that the Central African scores for especially Mexicans seem to be directly related to their documented Angolan origins. It is unfortunate that i did not have any Brazilian results to go by in my survey. As it can be expected that they would show an even greater pull towards Central Africa, atleast southeastern Brazilians5. For most of the nationalities in my survey the Central African contribution was secondary but still significant with average shares of in between 24% and 34%. Not highly variable therefore but rather consistent across this selection of the Diaspora. The only exception being my Cape Verdean samplegroup for whom a noticeably lower share of 11% Central African regions was reported. Similarly to the Lower Guinean regions being reported for Cape Verdeans these scores mainly represent Trace Regions with zero % estimates included. It remains to be seen how robust these regional scores will prove to be after future updates. Intriguingly however the average level of “Southeastern Bantu” for Cape Verdeans (6,7%) already turned up to be quite comparable with the group averages calculated for African Americans (6,5%) and Haitians (7,2%). So quite possibly some genuine Central African origins (Angola and Mozambique) might still be hinted at also for Cape Verdeans. For more indepth discussion see section 5 of this page. The last chart (2.5) i posted above shows the regional diversity/uniformity for each sample group as measured by the combined relative share of the two biggest African regions (∑ Top 2 score). Undoubtedly more sophisticated ways exist to measure heterogeneity and/or homogeneity. However in all its simplicity this chart already serves its purpose. We can observe that as expected Nigerians score the highest degree of regional uniformity (82,4%). Also other Africans seem to score above 80% or even 90% when combining their two biggest regions, judging from the results in this sheet. As expected Cape Verdeans are also near this African benchmark therefore (75,1%). Even when strictly speaking they are not a native African ethnic group but rather a derived one. A relatively high degree of regional uniformity is also found among the Mexican results (79,2%). A striking outcome possibly due to their documented African roots being mostly restricted to Upper Guinea and Angola with only a modest contribution from Lower Guinea. Which is unlike most other parts of the Afro-Diaspora. Even when all of my samplegroups do show a 3-way split between Upper Guinea, Lower Guinea and Central Africa, even Cape Verdeans! However the total amount of African ancestry is generally very low for my Mexican sample group. And random recombination might then come stronger into play. A lower degree of African descent might also account for the somewhat pronounced score (63,1%) for Puerto Ricans, even when by other measures they are actually among the nationalities with the most regionally diverse African origins (see charts 2.3 & 2.4). My Jamaican samples combine a high average of total African ancestry with a high degree of regional uniformity (68,6%). It stands in some contrast with the lower score of about 60% for both African American and Haitians. This outcome is perhaps to be explained by a narrower range of African origins for Jamaicans when compared to Haitians and African Americans. The lowest percentage of regional uniformity or rather the highest degree of regional diversity is obtained among my Dominican samples (57,8%). It might be too early to seek much meaning in this finding. Still it is possibly correlated with the Hispanic Caribbean and especially Santo Domingo having a very early involvement in Trans Atlantic Slave Trade. From the 1500’s onwards these Spanish colonies were being visited by slave suppliers of numerous European nationalities (Portuguese, Dutch, English, French and even Danes). In this way geographically wideranging circuits of African slave trade were connected to the Hispanic Caribbean area6. Quite likely during a longer period of time (especially when considering the clandestine slave trade to Puerto Rico and Cuba in the 1800’s) and including more African slave ports overall than any other destinations in the Americas (for a snapshot see this overview for Havanna in the 1800’s). Seen from that perspective a wider range of African origins for Hispanic Caribbeans and also occurring in more evenly balanced proportions is perhaps to be expected. It is regrettable i did not have a substantial number of Cuban results available to confirm for them as well. This high degree of regional diversity is also cristal clear when looking at chart 2.3. Neither Dominicans nor Puerto Ricans show a predominant (>50%) score for either Upper Guinea, Lower Guinea or Central Africa, unlike my other sample groups. Instead especially for Puerto Ricans a regionally balanced mixture has been the outcome, atleast when going by the group averages. 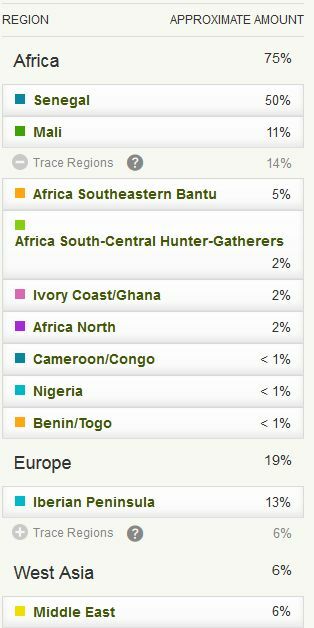 Another confirmation of their evenly mixed regional origins across West and Central Africa can be seen in chart 2.4. Which is featuring the frequencies of each region being ranked #1 for each of my sample groups. It can be verified that only the Hispanic Caribbean piecharts are showing a more or less evenly mix of the seven main African regions. Most strikingly so the piechart for my Dominican samples which includes all the main 7 African regions in almost equal colourful degree. 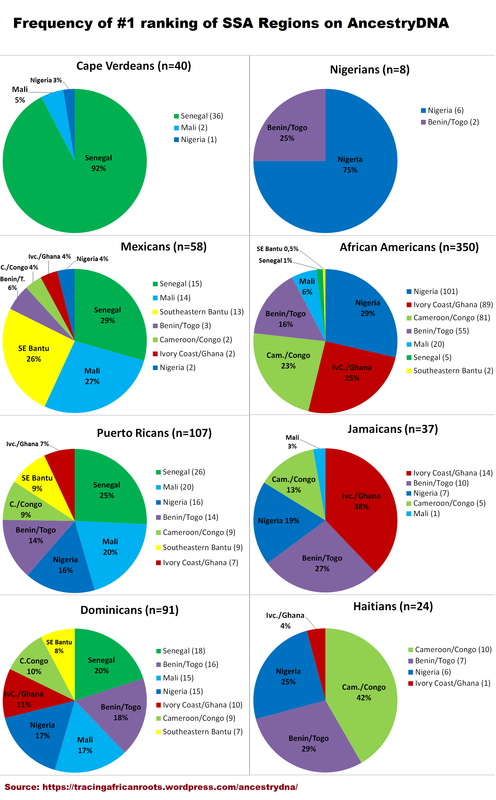 Making a comparison with the Hispanic piecharts it is also remarkable how the African American, Jamaican and Haitian piecharts are more confined across their regional range. Most noticeably the “Senegal” (darkgreen), “Mali” (lightblue), and “Southeastern Bantu” (yellow) portions seem to be either lacking entirely or only showing up marginally. Seeing the Mexican piechart side by side with the African American piechart is very illustrative in this regard. The top 3 main regions for Mexicans (“Senegal”, “Mali” and “Southeastern Bantu”) being the 3 regions least likely to be reported as #1 region for African Americans. While the inverse also holds true: the top 4 main regions for African Americans (“Nigeria”, “Cameroon/Congo”, “Ivory Coast/Ghana”, and “Benin/Togo”) being least likely to be reported as #1 region for Mexicans. Taking into consideration only the African American, Haitian and Jamaican results it seems to me that among these three Afro-Diasporic groups the African Americans might be the most regionally balanced population. In my survey i collected the largest samplesize for African Americans (n=350) and therefore i also have the most confidence in their group averages being representative. The samplesize for both Jamaicans (n=37) and Haitians (n=24) was considerably lower. Still also their group averages sofar seem to be in fair accordance with their documented African origins. Judging from the charts posted above we can already verify that African Americans are noticeably more Upper Guinean (17%) than both Haitians (11%) as well as Jamaicans (11%). The Jamaicans show a clear concentration of regional origins within the Lower Guinea zone (66%) and Haitians show a slight shift to Central Africa (even when a share of 34% is not predominant). Relatively speaking these regional zones show up less pronounced, and therefore more balanced, for African Americans on average. It is known that African Americans have proportionally more outlying origins from Senegambia and (northern) Angola or even Madagascar, especially when compared with Jamaicans. Their respective average scores for “Senegal” (8% versus 2,7%) and “Southeastern Bantu” (6,5% versus 3,2%) scores seem to act as a nice corroboration of the slave trade data. The documented African origins for Haitians are actually also wideranging from Mozambique to Senegal and definitely not confined to only Benin or Congo as they are often stereotyped to be. Still sofar their regional diversity seems to fall in between that of Jamaicans and African Americans. 4) Documented African origins confirmed on group level? To answer the question posed above might require a more sophisticated study than my survey which was merely intended as a preliminary effort. I have already made mention of several limitations in the first section of this page. Another circumstance pertinent to this section might be that the genepools across the Afro-Diapora appear not to have stabilized yet to produce predictable and consistent regional proportions. Especially when applied to the African breakdown of any random person belonging to a nationality featured in my survey. Implying that individual variation might often seem out of sync with group averages. Only my Cape Verdean sample group can arguably be said to form an exception to this rule. Even so, in the previous section it has already been established that distinctive regional patterns do seem to be emerging when examining the data on a group level. Determining the largest regional components within the African breakdown, on average, for each of my sample groups has been a primary research effort during my survey. Afterall these most prominent regional scores can be considered to have the highest reliability at this stage and might also be confirmed independently by historical sources. Establishing where each African region is relatively more pronounced or instead more subdued might therefore provide insightful clues into localized ethnogenesis across the Diaspora. In this section i will specify for each single African AncestryDNA region among which of my sample groups it peaks and how this fits in with what we know already. With the exception of “Africa North” and “South-Central Hunter-Gathers” because these regions usually only appear as marginal Trace Regions. The charts below have been sorted from highest to lowest group average for the region highlighted in pink/blue. But actually also the lowest regional scores offer a great deal of informational value. I have added in the Nigerian averages as well to serve as a second African control group along with the Cape Verdean results. It should be noted my minimal Nigerian sample group (n=8) is composed almost entirely of either Igbo and Yoruba individuals; no northern Nigerians are included. As was to be expected this first Upper Guinean region convincingly peaks for Cape Verdeans, even predominantly so (>50%). While it is almost absent for my Nigerian sample group (however Nigerian Fulani will very likely show significant amounts of “Senegal”). Cape Verdeans also showed the highest frequency of “Senegal” #1 rankings within the African breakdown (36/40, see chart 2.4). The predictive accuracy of this region therefore seems to be solid and verifiable. It should be noted that not only stricly Senegambian ancestry is being measured. 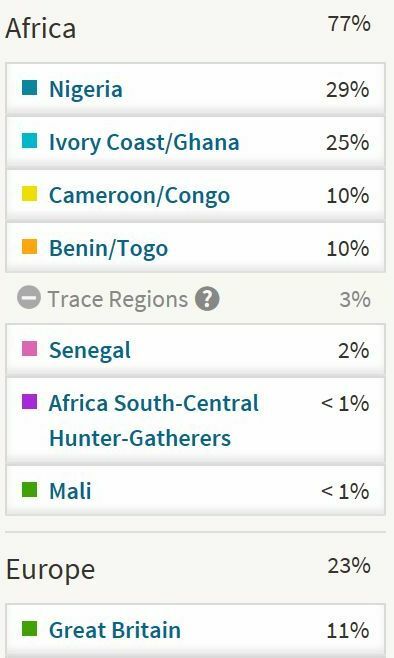 Aside from Guinea Bissau/Conakry this region is also describing DNA markers found in persons from as far south as Sierra Leone (see also the “African Results” page). Within the Americas it is clearly the Hispanic groups who show the highest average for “Senegal”. Specifically it is among Mexicans that the highest group average can be found and actually also among a smaller number of Central American results i have seen sofar (see averages for El Salvador and Honduras in this sheet). This finding seems to go very well in hand with a proposed Upper Guinean founding effect from the 1500’s in many Latin American countries. Manifesting itself most clearly in Mexico and Central America because these areas did not experience much documented African geneflow in later timeperiods and from additional other regions unlike for example the Hispanic Caribbean. My Jamaican and Haitian sample groups show the lowest average for “Senegal”. This is again in accordance with the slave trade data shown in chart 4.1. The African Americans are somewhat in between. Their documented share of Senegambian slave voyages (18/19%) seems to hold up well enough when we also take into consideration the “Mali” region as covering Upper Guinean origins (8% + 9,3% = 17,3%). But when it comes to the frequency of “Senegal” being ranked first within the African breakdown of African Americans (5/350), the difference with Hispanics is more striking (see chart 2.4). As discussed in the previous section this outcome might come as a surprise for those who assumed Senegambian ancestry to be the most prominent among African Americans. However it looks like this assumption was based on an incomplete overview of early slave trade connections between the Hispanic Americas and Upper Guinea. And possibly also an overstatement of the Senegambian contribution to African American genetics while the role of Inter-Colonial (with the West Indies) and Domestic Slave Trade (often by way of Virginia) has been either underestimated or overlooked. 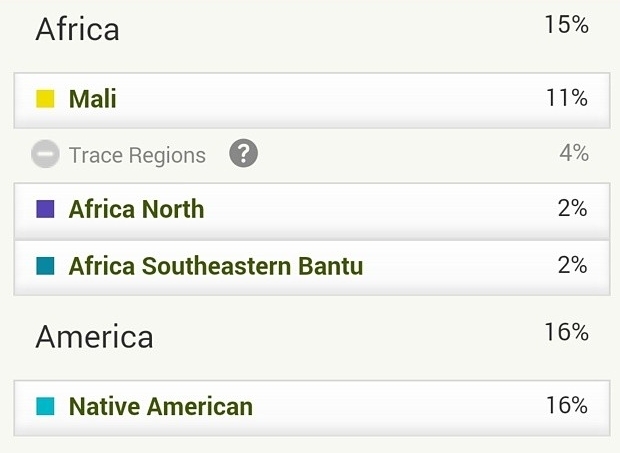 The socalled “Mali” region might be the least solidly defined genetic cluster according to Ancestry’s own information. However as expected my Nigerian sample group only shows a trace amount for it (again Nigerians with Fulani origins might show more of it). Significant regional overlap to the east and south of Mali might still occur especially with Burkina Faso. But otherwise “Mali” seems a fair enough indicator of Upper Guinean ancestry, even if less convincingly so than “Senegal”. This therefore second Upper Guinean region is again showing the highest averages among Hispanics and Cape Verdeans. Very intringuingly however it peaks among Mexicans, which might be suggestive of specific ethnic lineages from Upper Guinea being more prominent for them (and to a lesser degree also Dominicans and Puerto Ricans) than for Cape Verdeans. Given historical evidence these lineages are more likely to hail from Guinea Conakry or Sierra Leone rather than Mali itself, despite the labeling of this region. Making allowance for any inherent restrictions of the current AncestryDNA analysis it seems at least noteworthy that the proportional ratio of “Senegal” and “Mali” is nearly balanced for Mexicans (28,3% versus 24,5%) while it is clearly shifted to “Senegal” for Cape Verdeans (58,7% versus 15,3%). 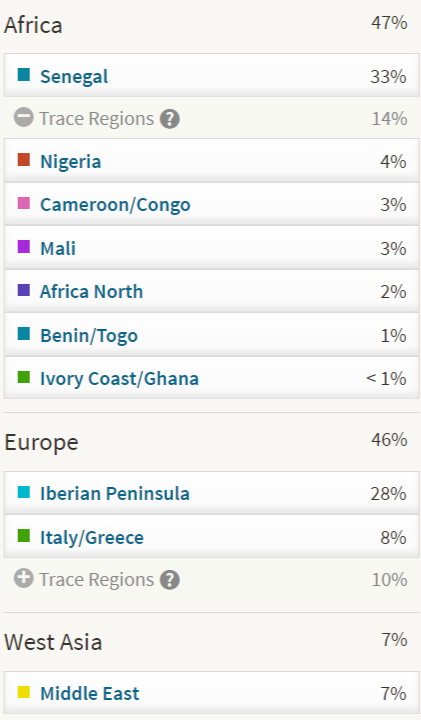 The highest level of Ghanaian ancestry seems to be detected among my Jamaican samples, going by the average for the region called “Ivory Coast/Ghana”. Actually this region could very well also be picking up ancestral connections to places further west, even beyond Ivory Coast into Liberia and Sierra Leone. 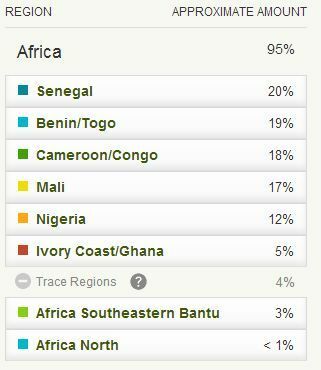 See also the “African Results” page where the AncestryDNA results of a Ghanaian, Ivorian, Liberian and Sierra Leonean person can be seen. Overall it seems the average for this region therefore does not only cover the socalled Gold Coast from slave trade statistics but also the Windward Coast and (part of) Sierra Leone. Still given the widely known (but sometimes also overemphasized) significance of Ghana/Akan lineage for Jamaicans this outcome seems very appropriate. This region is also showing up strongly for African Americans, again as expected. Perhaps for them the Liberia/Sierra Leonean ancestral option would be a bit more relevant than for Jamaicans. Among my Haitian samples a decent amount of “Ivory Coast/Ghana” is also being reported, on average 15% of their African breakdown. Although higher outliers and #1 rankings (1/24) were nearly absent for them (unlike for Jamaicans and African Americans, see chart 2.4). Still this finding might come as a bit of a surprise given known slave trade statistics (about 5% being documented for Haitian slave voyages originating from the Gold Coast + Windward Coast, see chart 4.1). I suppose it might suggest that the ancestral consequences of Inter-Carribean slave trade (especially from Jamaica) into Haiti might have been underestimated or overlooked sofar. The generally trace level amounts of “Ivory Coast/Ghana” being reported for Mexicans and Cape Verdeans would be justifiable given the rarity of documented Ghanaian presence in especially Cape Verde. It might as well be signalling some generic SSA markers which cannot be placed accurately within the current AncestryDNA setup. Then again it could also be suggestive of Sierra Leonean ancestry. 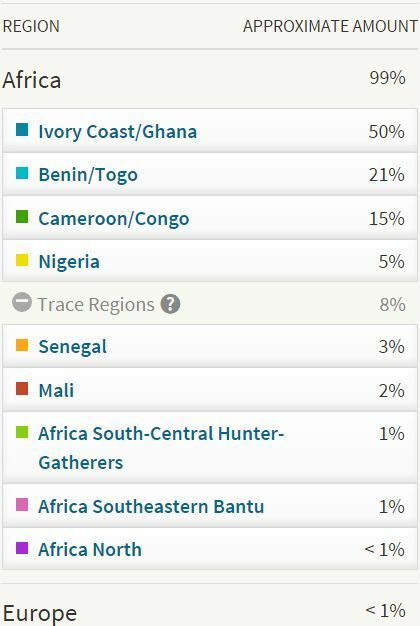 The lowest average for “Ivory Coast/Ghana” is being reported for my Nigerian sample group, suggesting that this region is showing little overlap with areas to the east of Benin. Which would be in support of its predictive accuracy. For Hispanics the “Ivory Coast/Ghana” scores are more intermediate although the averages for Puerto Ricans and Dominicans are hiding much variation. For many individual persons from the Hispanic Caribbean this region still turned out to be the biggest one in their African section. This substantial outcome is highly suggestive of the additional importance of Inter-Caribbean (often contraband and undocumented) slave trade to explain the African origins of Dominicans and Puerto Ricans. In the Slave Trade data featured above (chart 4.1) the Gold Coast and Windward Coast shares are conspiciously low or even absent for Hispaniola & Puerto Rico! In fact because of substructure it could very well be that Puerto Ricans of predominant African descent (>50%) might show much higher “Ivory Coast/Ghana” scores, also on average. Unfortunately i was only able to include a few of such results among my sample group. This socalled “Benin/Togo” region is most significant for my Nigerian sample group. Which underlines my earlier disclaimer that country name labeling of ancestral components should not be taken at face value. Due to inevitable regional overlap and bordercrossing ancestral connections, both recent and ancient ones. This might be seen as somewhat misleading but the truth of the matter is that the labeling of ancestral categories is bound to be a complex affair and might never be 100% satisfactory. Keeping in mind Nigeria’s huge ethnic diversity it is actually reaffirming that my Yoruba samples showed a clear tendency to high and at times even predominant (>50%) “Benin/Togo” scores. Yorubaland being situated mostly in western Nigeria right next to the border of Benin but infact Benin itself is also home to a significant Yoruba minority. While my Igbo samples from southeastern Nigeria usually also showed significant amounts of this region but as expected to a decreasing degree. Judging from a few Cameroonian results i have seen this region might generally not expand further east than (southern) Nigeria. In line with their documented African origins, “Benin/Togo” is showing the lowest averages for Cape Verdeans and Mexicans. 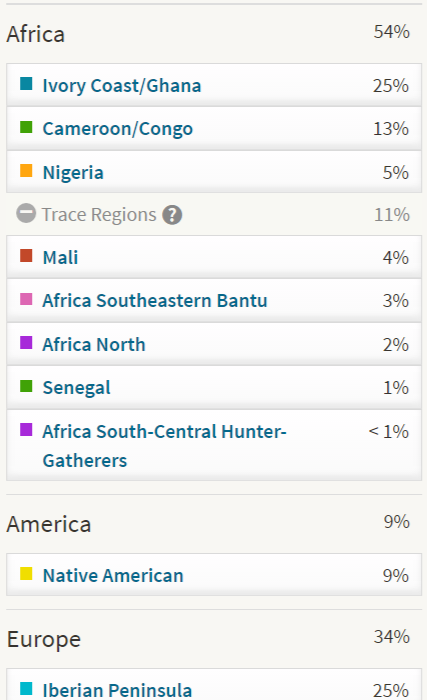 My Haitian sample group reached the highest “Benin/Togo” level, across the Atlantic. This finding is even more of a redemption given the well known ancestral significance of Benin for Haitians (even if at times overemphasized). Only to be rivalled perhaps by Brazilians from Bahia state. Still the Haitian average for this region is only slightly higher than what was obtained for Jamaicans. The average for African Americans is also surprisingly high and actually includes many extreme outliers (maximum relative score being 58% of total African). The Dominican and Puerto Rican averages are somewhat intermediate but yet again hiding much variation and also including high outliers. As was also the case for “Ivory Coast/Ghana” the TAST database (see chart 4.1) is generally not covering these origins for Puerto Rico and Hispaniola. Instead of Trans Atlantic slave voyages it seems to be widespread Inter-Caribbean slave trade which can be related to their “Benin/Togo” scores. Possibly for the Dominican Republic also ancestral connections with runaway slaves from Haiti might be hinted at. The AncestryDNA region called “Nigeria” is clearly culminating for Nigerians, as it should. Actually in pretty much the same way as “Senegal” has been predominant for my Cape Verdean sample group. Also the reverse holds true: while “Senegal” showed up in only trace amounts for my Nigerian sample group, “Nigeria” reaches its lowest average among my Cape Verdean sample group7. 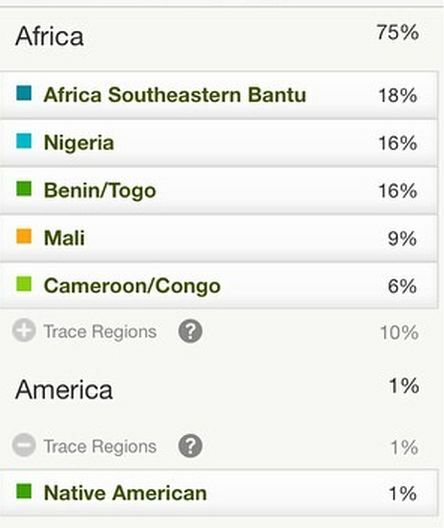 Judging from the additional “Benin/Togo” and “Cameroon/Congo” averages being shown for my Nigerian sample group the socalled “Nigeria” region may not be reporting the full extent of someone’s genuine Nigerian origins. This is also mentioned on the website of Ancestry.com, their own 67 Nigerian samples scored 69% “Nigeria” on average. The “Nigeria” average for my Haitian sample group is not trailing behind that much either and represents a solid 17% of their African breakdown. Which might seem somewhat out of line with Haiti’s Bight of Biafra share (4,9%) in the TAST database (see chart 4.1). This database however does not account for the clandestine slave smuggling into Haiti, carried out by the English and often involving Igbo’s and other Biafran captives. This rather high “Nigeria” average for Haitians is also explained by the Bight of Benin share in slave trade to Saint Domingue (26,3%). The captives being shipped from this area were not all exclusively Beninese but often also originating from western Nigeria (Yoruba’s/Nago) and even from northern Nigeria (Nupe & Hausa, especially in later timeperiods). For both Dominicans and Puerto Ricans “Nigeria” turned out to produce the highest group average when compared with the other two Lower Guinean regions (“Ivory Coast/Ghana” and “Benin/Togo”). Again it should be noted that much variation and frequent outliers are being obscured by these averages. Also it is very likely that Puerto Ricans of predominant African descent or just even with higher than average total African amounts will show a significantly larger contribution from “Nigeria” (see this chart). This finding that “Nigeria” is having a slight edge among Hispanic Caribbeans is supported by the TAST Database (see chart 4.1) where it seems direct African voyages from the Bight of Biafra to both Hispaniola (16,8%) and Puerto Rico (27,9%) have been documented in far greater extent than from the Gold Coast or the Bight of Benin. It is interesting to speculate what this might suggest about the likely ethnic origins being implied by the “Nigeria” scores for Dominicans and Puerto Ricans. At this stage the information available might still be fragmentary but possibly Igbo (“Carabali”) origins are much more prevalent than Yoruba (“Lucumi”) origins. Even though these last ones, perhaps for cultural prestige reasons, are usually most emphasized. This combined region of Cameroon & Congo complicates the comparison with the TAST database. Because genetic connections to both the Bight of Biafra (Cameroon, eastern Nigeria) and West Central Africa (Congo, northern Angola) are being described. The considerable “Cameroon/Congo” average (14,8%) for my Nigerian sample group already alerts to that somewhat unfortunate circumstance. However as expected only my Igbo samples were given >10% “Cameroon/Congo” scores and not my Yoruba samples (see this sheet). Despite the imperfections of this category the prominence of Congolese ancestry among Haitians seems to be confirmed in the averages shown above. “Cameroon/Congo” is clearly peaking for my Haitian sample group. The average calculated sofar might be less pronounced than expected perhaps. According to the TAST Database Central Africa is said to have been the embarkation region of practically half of all African captives transported to Haiti (see chart 4.1). This deviation might yet be explainable because of several reasons such as limited sample size, additional Inter Caribbean Slave Trade, timing of arrival for Congolese captives etc.etc. But at any rate this region definitely stands out for Haitians and in this sense can be said to validate its predictive accuracy. See also the #1 rankings of this region for Haitians (10/24), (chart 2.4). 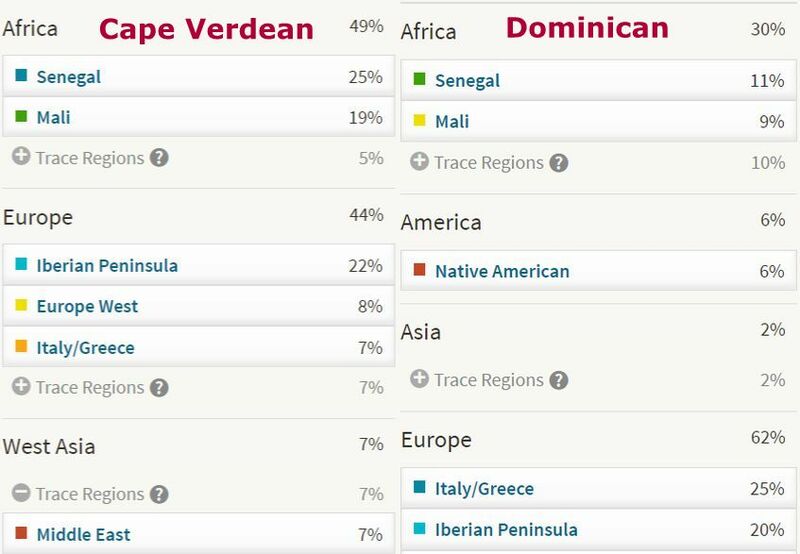 As expected the lowest average for this region is being shown for my Cape Verdean sample group. But generally speaking also the “Cameroon/Congo” scores for Hispanics seem somewhat subdued given their widely reported ancestral and also cultural ties with Central Africa. Even when the reported averages are still quite considerable for especially Dominicans and as always hiding much variation. Again because of substructure it should be pointed out that this region might be more significant for Puerto Ricans with above average African amounts (>35%). But as will be discussed in further detail below it is actually “Southeastern Bantu” which proved to be more significant for many Hispanics, in particular Mexicans, which could be suggestive of their Central African DNA pulling more towards to Angola rather than to Congo. The ancestral implications of this region are potentially very wideranging, judging from the descriptions given by Ancestry.com. However it seems likely that primarily ancestral connections with Angola and Congo (interior) are being pinpointed for the nationalities in my survey (see also this map). Such an interpretation would be based on historical plausibility. For example to be verified by the much larger frequency of Central Africa as a region of provenance versus the usually minimal mentioning of Southeast Africa in the TAST Database (see chart 4.1). But also to be validated by the very useful outcome seen above: Mexicans are undisputed when it comes to their relative “Southeastern Bantu” contributions. The Angolan presence in 17th century Mexico is very well attested for. In fact also other parts of the Hispanic Americas are known to have experienced a socalled Angolan wave during the 1600’s. It is tempting therefore to also assign the notable “Southeastern Bantu” averages for Dominicans and Puerto Ricans to their documented Angolan roots. It is probably too early to delve into this question already, especially as my Mexican sample group is almost lacking of persons with higher African amounts (>10%). But it is quite striking that even though the Mexican average for “Southeastern Bantu” is as expected the highest among my surveyed nationalities (even more so when looking at the frequency of #1 rankings, see chart 2.4). Still the Upper Guinean origins (as measured by “Senegal” + “Mali”) of my Mexican sample group seem more pronounced. Because of plentiful documentation the Angolan connection for Mexicans is often mentioned by historians, but perhaps to an exaggerated degree. An insightful clue might be forthcoming from the latest TAST data (as shown above in chart 4.1)) in which the Senegambian slave voyages arriving in New Spain (41,1%) are noticeably higher than for Veracruz (21,9%). Slave voyages originating from the Hispanic Caribbean or even Spain/Portugal (the socalled black ladino’s) still being left out of the picture. Getting into the specifics of African geneflow into the Mexican population is made difficult because of dramatic demographic shifts taking place during the 1500’s. However this preliminary data, based on 58 randomly picked Mexican AncestryDNA results, seems to suggest more African mestizaje might have taken place within the general population in the 1500’s when Upper Guineans were predominant than during the early 1600’s when Angolans were indeed an overwhelming and absolute majority among the enslaved captives. It might very well be different though for bottlenecked populations of Afro-Mexicans living in the states of Oaxaca, Guerrero and Veracruz. It might be insightful to also include the “Cameroon/Congo” averages into the analysis and compare the ratio’s for these two related and probably overlapping Central African regions. The Mexicans stand out for showing a much higher “Southeastern Bantu” average (22,1% versus 5,3%). For Puerto Ricans it is nearly balanced (11,9% versus 10,6%) and for Dominicans it is also quite close (10,3% versus 13,7%). However “Southeastern Bantu” is clearly trumped by “Cameroon/Congo”, on average, for the non-Hispanic nationalities. Most of all for my Jamaican samples (3,2% versus 19,8%). This finding might be correlated with documented slave trade from Central Africa usually originating from north of the Congo river, when carried out by the English, French and Dutch. Still some considerable “Southeastern Bantu” averages and outliers can be observed for especially African Americans and Haitians. And in fact (northern) Angolan and interior Congolese origins would not be unheard of for them at all. Reaffirming its predictive accuracy the socalled “Southeastern Bantu” region is reaching an absolute low with my Nigerian sample group. However intriguingly the “Southeastern Bantu” group average for Cape Verdeans is quite considerable when compared with the other nationalities. Given that this average is based on mostly Trace Region reporting and also because of other remaining uncertainties this outcome needs more researching (see also section 5 of this page). Still i suppose atleast a part of these findings might point towards genuine ancestral PALOP connections for Cape Verdeans. This section is intended to illustrate the individual variation and display the maximum scores of the various African AncestryDNA regions among my survey participants. Naturally it is only a limited selection and not intended to be representative per se. For most people in my survey the regional breakdowns of their African component turned out considerably more balanced. Below is an example of very evenly divided regional proportions which demonstrates the generally thoroughly mixed and regionally dispersed origins within Africa of my sample groups. In order to research the least diluted regional lineages across the Diaspora i will be mostly focusing however on the maximum scores for each region. Results which feature one region in extra pronounced degree. Statistically speaking some of the screenshots below may be considered atypical or even bona fide outliers. However in other cases similar results are actually to be observed with great frequency among the selected nationality. My accompanying comments should be taken as informed speculation on my part. They are not meant to exclude other possibilities or simplify complex family histories. As far as I was able to verify all of these screenshots below are from persons with two parents from the said nationality (unless specified otherwise). I like to thank again all the persons who kindly agreed to share their results with me! These results below show the greatest similarity to the regional group averages i have calculated for each of the seven nationalities i have been comparing on this page. This selection is based on the limited amount of results that were available to me, so it will not always correspond perfectly. Still they seem to be reasonably representative for each sample group. Especially with regards to their total African amounts and the ranking of the main African regions. Despite being “average” in this sense, using other measures one might distinguish various other sorts of “typical” results as well. Afterall it has already been noted that a great degree of individual variation is to be observed and also substructure or subgroups might be present. Actually it took me quite some effort to select these screenshots. Highlighting that statistical averages, even when valuable in themselves, should always be complemented with additional information if you want to acquire more insight. 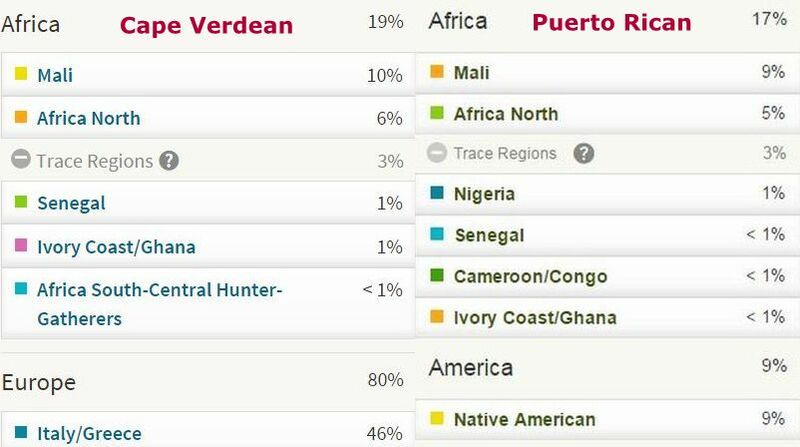 This Cape Verdean result is from a person with family origins from the island of Santiago. This island is known to have a population which is less admixed on average and therefore of greater African descent than the other islands. However practically all Cape Verdeans in my sample group (36/40) showed a similar predominance of “Senegal” in their African breakdown. This person’s family is from Santo Antão island. The relative “Senegal” score of 70% (33/47) is one of the highest i have observed among Cape Verdeans. This African American result belongs to a person with family origins in South Carolina. Sofar i have observed the greatest frequency of prominent “Senegal” scores for this state as well as Louisiana. His son actually had an even higher “Senegal” amount of 25%, but it was not the biggest region in his breakdown. The maximum score of “Senegal” being only 25% for the 350 African Americans in my survey suggests that this type of regional ancestry might have been diluted to a greater degree than the other regions. 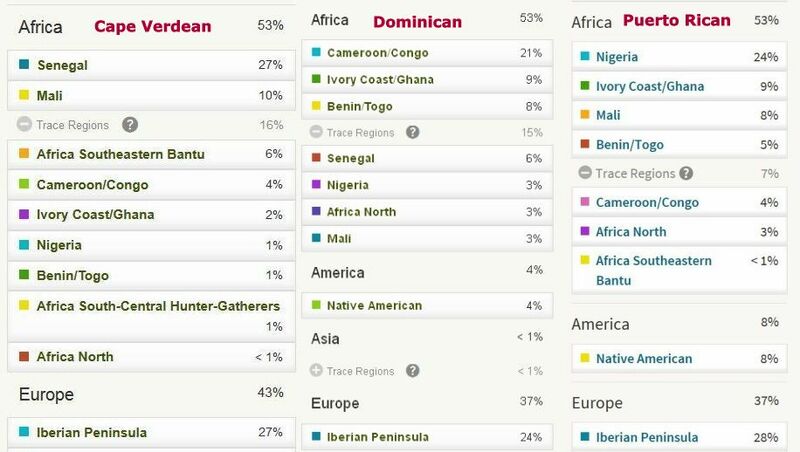 This Dominican’s “Senegal” score of 20% is equal to the African American result shown above. However proportionally speaking it is more significant as the total African amount is 50%. Resulting in a regional contribution of 40% (20/50) versus 21% (20/95) for the African American. High “Senegal” scores can be seen among Dominicans of varying admixture degrees. In this case, combining the “Senegal” with the “Mali” amounts, this person is practically 2/3 Upper Guinean in his African origins (20/30). If it were not for the 6% Native American this could actually very well also be a DNA profile for a Cape Verdean, eventhough on average a Cape Verdean would have a higher total African amount (40-60%). High “Senegal” scores have been prevalent especially for Puerto Ricans of minor African descent (<25%). Puerto Ricans of above average African descent (>35%) usually have much more subdued “Senegal” scores. Sofar i have not seen anyone of them being reported with “Senegal” as the biggest region, unlike what i have observed among Dominicans. Many Mexicans among my sample group only received African Trace Regions because their African ancestry is almost always minimal. In these two cases below “Senegal” is appearing above trace level which makes it an even more convincing score i suppose. I have only seen a few results from El Salvador. Sofar their predominant African regions are mirroring those shown for Mexicans, but usually in a more pronounced degree. 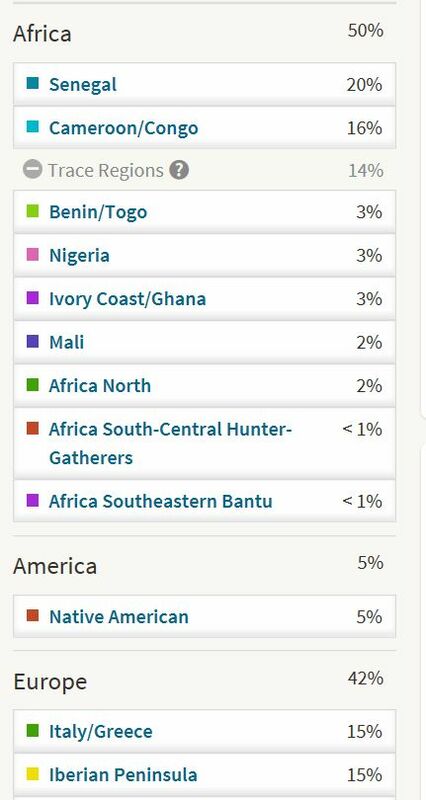 This result below is quite extraordinary for not only showing the highest “Mali” percentage among my sample group of 350 African Americans, but also the second highest score for “Southeastern Bantu”. This result from Jamaica is also unprecedented because it features the same outstanding “Mali” percentage of 42%, but it is also combined with a lower total African amount of 52%. Which means that proportionally speaking this Jamaican would be an astonishing 80% (42/52) “Malian” on his African side. 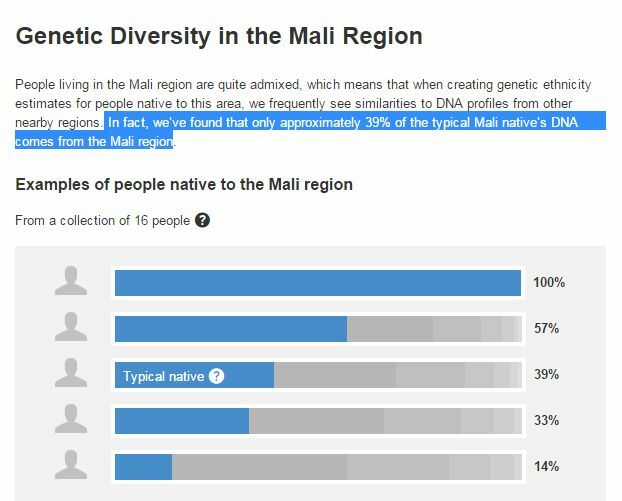 Ironically for the socalled “typical native” from Mali only an average of 39% “Mali” was found! 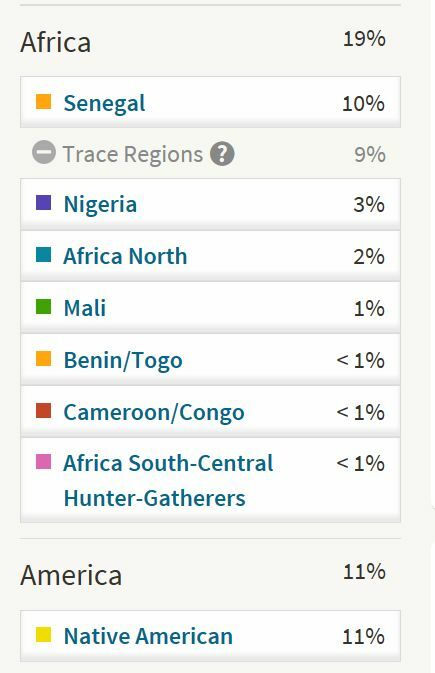 ( based on the 16 Malian samples used by AncestryDNA, see this screenshot from Ancestry.com’s website). The “Mali” amount being shown below (24%) is the highest i’ve seen sofar among Cape Verdeans. 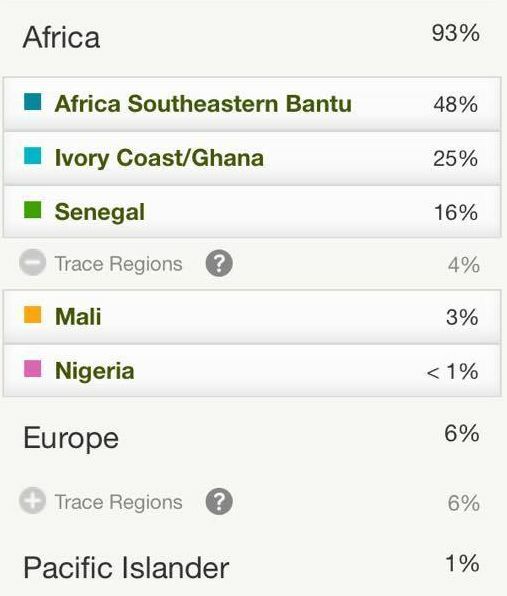 Interestingly an almost equally divided breakdown of “Senegal” and “Mali” is obtained with minimal trace regions. In my survey nearly all Cape Verdeans tend to show a clear shift to “Senegal” as predominant African region. However this example and the second one directly below highlight that individual variation still exists. Also among Cape Verdeans who relatively speaking proved to be the most homogenous in their African origins during my research. These deviating “Senegal”/”Mali” proportions might suggest a distinctive Upper Guinean lineage for this person. 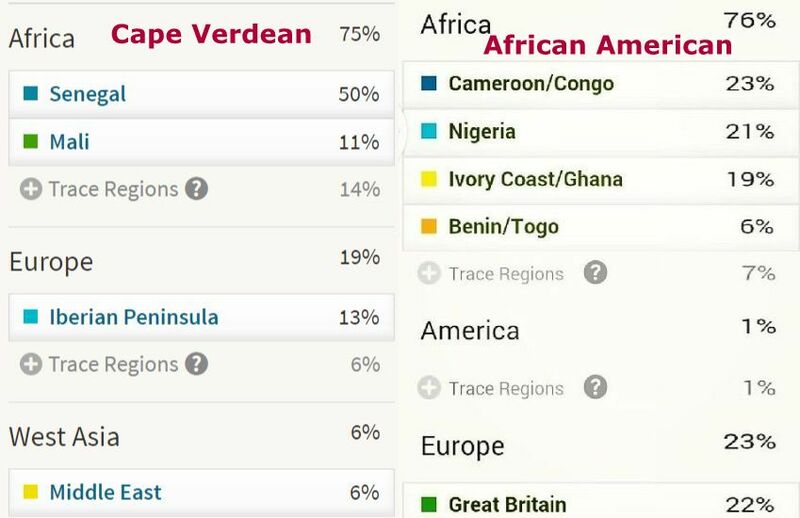 Almost all Cape Verdean results in my sample group had “Senegal” as biggest African region (36/40). “Mali” usually gets reported in second place (16/40). However for two persons it was instead “Mali” which turned out to be the biggest African region. One person had “Nigeria” and another one had “Africa North” as biggest region. Perhaps not by coincidence these persons all showed lower than average African amounts and also all had Brava/Fogo island family origins. This is the second-highest “Mali” score i have observed among Puerto Ricans. Interestingly, high “Mali” scores are equally frequent among both Puerto Ricans with above average African amounts (>35%), as well as Puerto Ricans with lower African amounts (<25%). It is one of the few regions for which i could not establish any substructure (according to African admixture level) among my Puerto Rican sample group. Still i suppose the underlying ethnic origins and the dating of geneflow could be differentiated. This is the highest “Mali” score i have seen sofar for Mexicans. 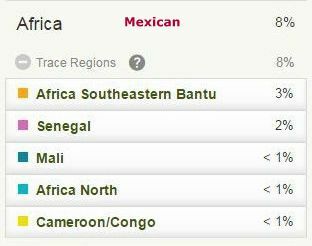 This is the highest relative “Mali” score for the Mexicans among my sample group, it represents 85% (6/7) of his total African ancestry. Aside from predominant amounts (>50%) of “Ivory Coast/Ghana” these Jamaican results below also show an impressive degree of regional homogeneity in their remaining breakdown. Very illustrative of the patterns discussed in section 3. 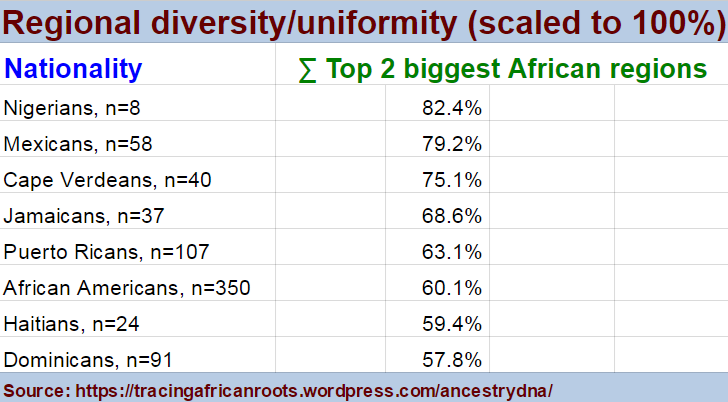 The combined top 2 score of the first result is extraordinarily high, it is 90% of his total African ancestry (85/94). This second result looks very similar to the one above with the exact same amount of 53% “Ivory Coast/Ghana”. One difference being that “Nigeria” is combined with “Cameroon/Congo” this time. However actually all of it could still be from the wider Bight of Biafra hinterland, as also the Igbo’s among my Nigerian sample group showed substantial “Cameroon/Congo” in their breakdown. This nearly 100% African breakdown is showing a combination of “Ivory Coast/Ghana” with “Benin/Togo” instead. In spite of the labeling i suppose (non-Akan) Ghanaian origins could also be captured (in part) by that latter region. Which would increase the overall predominance of most likely Ghanaian roots for this person. The trace regions seem to be very typical of the least significant regions for Jamaicans as a group. Even when for individuals there might still be variation. This African American result below features the same exceptionally high 53% “Ivory Coast/Ghana” score as the two Jamaicans seen above. Because this person’s total African amount is 90%, the relative score is even higher (53/90=58%). His African composition otherwise also resembles the previous Jamaican results rather closely. Which seems reflective of the great degree of genetic similarity between Jamaicans and African Americans. 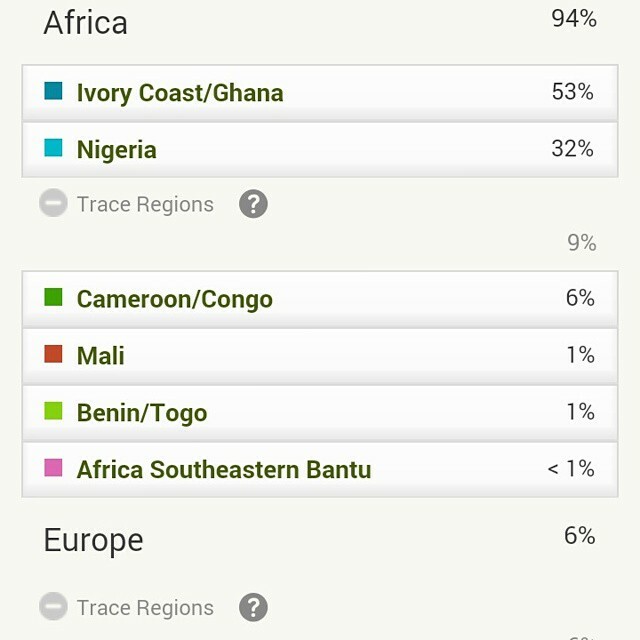 This result also shows one of the largest regional contribution of “Ivory Coast/Ghana” among my African American sample group. Because of the additional 10% “Senegal” and the 1% “Native American” it can perhaps be seen as more recognizably African American. These last two regions being relatively more uncommon for Jamaicans. This Dominican received a very high relative score for “Ivory Coast/Ghana”, it represents 63% out of the total African breakdown (21/33). “Ivory Coast/Ghana” produced one of the lowest group average among my Puerto Rican samples. However for Puerto Ricans with higher than average African amounts (>35%) it is featured prominently several times. As is also the case for the person below. Possibly suggestive of relatively more recent African geneflow (1700’s/1800’s instead of 1500’s/1600’s), likely also by way of neighbouring Caribbean islands. 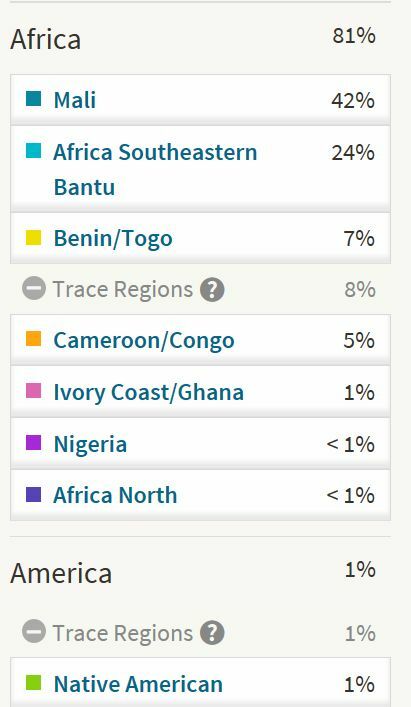 This Belizean result shows one of the highest “Ivory Coast/Ghana” relative scores i have observed: 67% (46/68) out of his total African ancestry. The regional African blend of Belizeans is likely to follow that of Jamaicans quite closely. This Honduran result is quite exceptional in that almost all African ancestry is described in terms of the “Ivory Coast/Ghana” region (8/9=88%). It might be tempting to assume it would be traceable to just one single African ancestor. But theoretically it would still be possible that these regional DNA markers were inherited from several African ancestors (all from the same approximate area) and also along more than just one particular family line. Below can be seen the highest absolute score (60%) for a single African region i have encountered during my survey. The fact that these kind of percentages above 50% prove so hard to find seems to speak volumes about the generally heavily blended African origins for Afro-descendants. With each regional lineage usually being greatly diluted. However not so in this particular case. “Benin/Togo” is truly overriding in this breakdown (60/83=72%). Still the smaller proportions of “Cameroon/Congo” and “Senegal” indicate that also this person is ultimately of mixed African origins. A distinctive compostion for several reasons, not least because this Haitian is of fully African descent! Most Afro-Diasporeans, incl. Haitians, will show some non-African admixture to some degree. However Haiti might possibly have the greatest frequency of people of 100% African descent. In my survey i have encountered one other Haitian with a 100% African amount. But i actually also observed 100% African scores for 6 African Americans and 2 Jamaicans sofar. It might be very insightful to do a survey of people of 100% African descent across the Afro-Diaspora, and then compare their regional components. The top 3 main regions for this person seem very representative for the most significant documented African roots of Haitians: Bight of Benin and Central Africa. This combination is very unlikely to occur for any African-born person, unless their parents are from different countries. The “Benin/Togo” score is the highest i have seen sofar for Haitians. And actually also the 18% “Southeastern Bantu”. The Jamaican result below shows a slightly higher “Benin/Togo” score than the Haitian result above. Illustrating the regional overlap across the Diaspora. However the actual ethnic origins which gave rise to this score may very well be different for both. All things being the same the chances of the Haitian having ancestral connections to a genuine Beninese ethnic group (or groups) are probably greater than for the Jamaican. 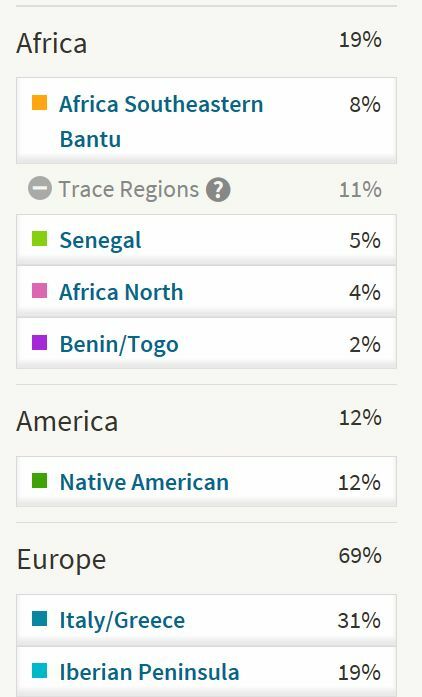 This second Jamaican result again seems to show an uniquely preserved lineage from just one African region, labeled “Benin/Togo” by Ancestry.com. It represents 78% (32/41) of this person’s total African ancestry. One of the highest relative scores I have seen for “Benin/Togo”. Perhaps also to be explained by this person’s relatively higher level of non-African ancestry and recombination but still very impressive. This person shows the highest (unscaled) amount of “Benin/Togo” i have observed among African Americans sofar. Surprisingly the frequency of high outliers for this region among African Americans turned out to be greater than for all other regions, safe “Nigeria”. Which seems out of sync with the generally low number of captives who are documented to have been transported from the Bight of Benin to North America. 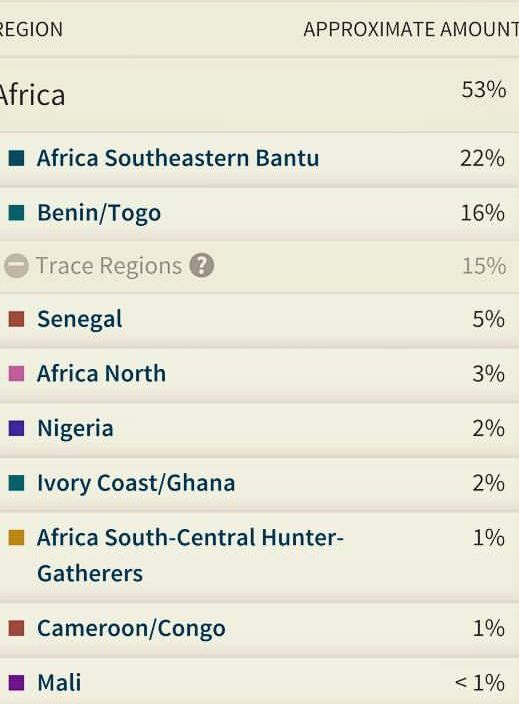 This result shows the highest relative contribution of “Benin/Togo” i have seen sofar among African Americans. Calculated as ratio of total African ancestry it is 60% (45/75). 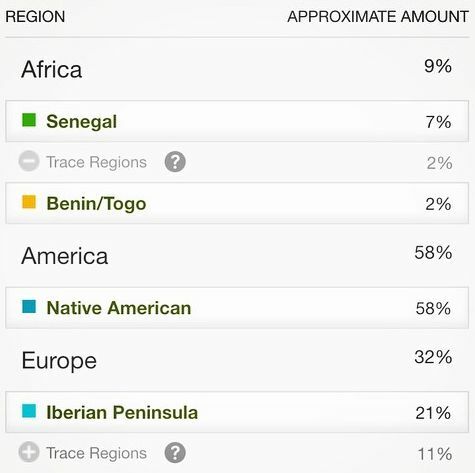 I have seen 7 other African American results which showed a relative score of above 50% “Benin/Togo”. Four people scored more than half of total African ancestry for “Ivory/Ghana”. While for “Cameroon/Congo” and “Mali” there were only 2 results with regional scores above 50%. 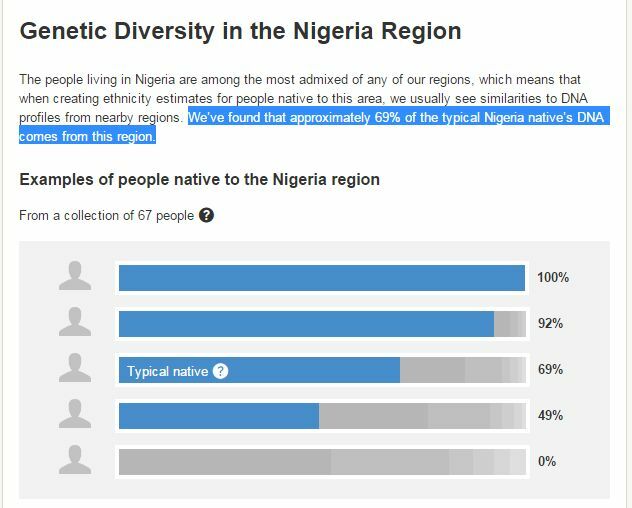 “Nigeria” seemingly being in a league of its own as it had 18 such results and is the only region to show a relative share of total African ancestry of above 60% and up to 70% in a few cases. Perhaps only by coincidence but “Benin/Togo” has appeared prominently for several Dominican results who also showed the highest degree of total African ancestry in my survey. The relative score below is 62% of total African ancestry (43/69). This result belongs to the Dominican with the highest total African amount sofar within my sample group and also the highest “Mali” amount. Still it is the “Benin/Togo” score which is most striking, representing almost 50% of his African roots (37/78=47,4%). An exceptionally high preservation of just 1 specific African regional lineage also to be seen for the Trinidadian below. It represents a regional contribution of above 80% within the African breakdown (27/33). Given a confirmed French Caribbean connection in this person’s family tree (as may be the case for many other Trinidadians as well, see this blogpost) the possibility of this “Benin/Togo” score pinpointing origins from within Benin’s borders might be greater than for people who are of strictly Anglo-Caribbean origins because of different French slave trade patterns with a higher continued focus on the Bight of Benin. The “Nigeria” region seems to represent the relatively least diluted African lineages among my African American sample group. It is the only region to show relative scores of inbetween 60-70% of total African ancestry. Also i have observed the greatest number of 50%+ amounts (unscaled) for this region. For 5 African Americans in my sample group (n=350) i registered a >50% “Nigeria” amount, incl. the next two following results. The group average for “Nigeria” was second-highest among my Jamaican samples. Despite a steady consistency sofar i have not observed too many exceedingly high scores for this region among Jamaicans. Probably due to a still limited sample size but possibly certain parishes might exhibit a greater degree of undiluted Nigerain lineages than others. This person below received the highest relative score (24/45=55,6%) i have seen among Jamaicans sofar. The relative score of “Nigeria” is below 50% for this Jamaican (29/77=37%). But it is still quite prominent, even when combined with an almost equally high amount of “Ivory Coast/Ghana”. Also noteworthy how this person’s top 4 of main African regions – as well as the total African amount and the minor European being mostly “Great Britain” – all seems very similar to what an “average” African American’s breakdown would look like according to my survey. The highest “Nigeria” score among my Haitian samples, both the original amount and proportionally so (39/90=43%). This result showed the highest relative “Nigeria” score among my Dominican samples: 65% (19/29). Interestingly there is a connection to the socalled Samana Americans. Who are the descendants of African Americans who migrated to the Dominican Republic in the 1800’s. Possibly it might account for the extra high level of “Nigeria”. Although in fact many Dominicans among my sample group without this background also came back with high “Nigeria” scores. This Puerto Rican’s African breakdown seems perfectly in line with the main patterns i have observed sofar for Puerto Ricans of above average African descent often scoring high amounts of “Nigeria” as well as “Mali”. This person’s father is from Loiza which is known for being a center of heavily African influenced cultural traditions. This second Puerto Rican is more representative of Puerto Ricans who only have minor African ancestry. Still the relative score for “Nigeria” is very impressive: 69% (9/13). The highest among my Puerto Rican sample group. As mentioned previously this region is rather ambigious as it might signal ancestral connections to both the Bight of Biafra (eastern Nigeria & Cameroon) as well as Central Africa (Congo & northern Angola) or even both of these areas at the same time! The first result belongs to someone who is from South Carolina. Given the strongly documented presence of Bakongo people in that state it seems tempting to assume that in this case Central African ancestry is being picked up on. But other ancestral options still remain possible as well. 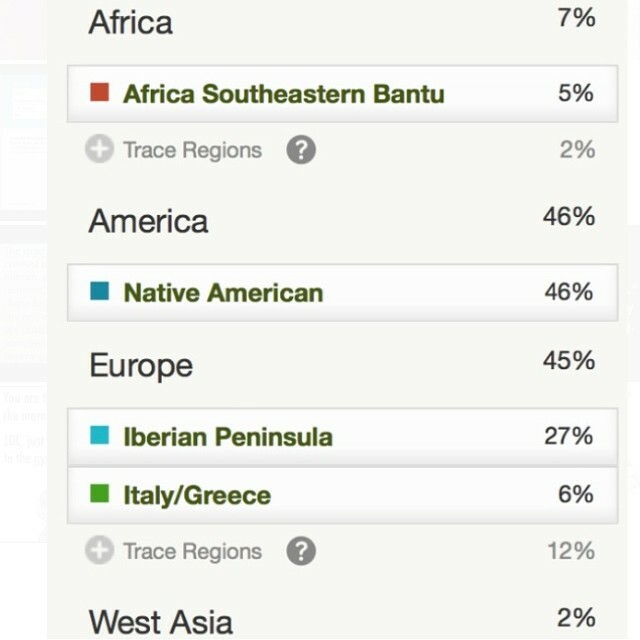 The same amount of 47% “Cameroon/Congo” is being shown for this second African American. Again very impressive and proportionally even more significant because it is predominant within this person’s total African amount (47/78=60%). My Haitian sample group was the smallest in number among the seven nationalities i compared on this page. However i have already come across several results featuring 40%+ “Cameroon/Congo” scores. I would not be surprised to also see Haitians with 50%+ “Cameroon/Congo” amounts eventually. This first Haitian result below shows the highest “Cameroon/Congo” score i have seen sofar. Combining with the 6% “Southeastern Bantu” it might imply about half of this person’s origins being from Central Africa. However also some Biafran/Cameroonian origins might still be included. The “Nigeria” score is afterall also quite considerable. Interestingly this person is from Northern Haiti & Tortuga. Compared with other regions in the country the northern part of Haiti might have received the largest proportion of captives from Central Africa, more than 50% of the ones brought over directly by the French according to Geggus (2001) (see also this chart). Based on the the TAST Database, “Cameroon/Congo” will imply Congolese origins for Haitians, moreso than for African Americans and Jamaicans, even when Biafran connections are also still possible. 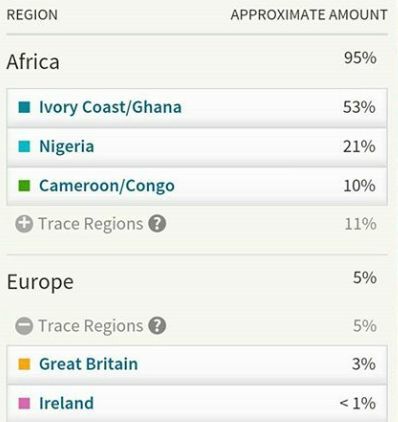 An exact same amount of 42% “Cameroon/Congo” out of 95% total African is being reported below for a Jamaican. Also the top 4 main African regions looks quite similar to the Haitian breakdown directly above. Highlighting once again the great degree of shared regional origins within Africa across the Diaspora, at times also proportionally speaking. Even when generally speaking Jamaicans might have a lower degree of Central African ancestry than other parts of the Afro-Diaspora on average. This result below seems to suggest that this is not always the case. “Cameroon/Congo” is clearly the biggest region being shown and makes up almost half of the African breakdown (42/95). Technically speaking also Bight of Biafra connections might be suggested but given the minimal amount of “Nigeria” this is perhaps less likely. I have not really observed expectionally high scores (either proportionally or unscaled) for “Cameroon/Congo” sofar among both Puerto Ricans and Dominicans. Possibly due to sampling limitations. Quite likely Puerto Ricans of predominant African descent (>50%) might show greater amounts. Dating mostly from the late 1700’s/1800’s, and relating to mainly Congolese ancestry (Bakongo). People from the Congo would actually already have been present in Puerto Rico from the early 1500’s, often brought in via São Tomé. But these bloodlines are probably much diluted by now. This result below features the second highest score i have seen sofar among Puerto Ricans. This person below is truly Hispanic Caribbean as she has recent family origins from all three Greater Antilles islands and in addition also from Martinique. She also happens to have the highest relative score of “Cameroon/Congo” among my survey. It represents 75% (=15/20) of her African roots. Quite extraordinary as among my 107 Puerto Rican samples the highest relative score for this region was “only” 44.7% and among 91 Dominicans the maximum relative score was even lower at 39,6%. It is quite remarkable that almost all Mexicans in my sample group received “Southeastern Bantu” rather than “Cameroon/Congo” percentages. As described in the previous section this outcome is quite likely signalling that the Central African origins of Mexicans are moreso shifted to Angola than Congo. Which would be in line with historical documentation. However in individual cases Mexican results still do appear with meaningful “Cameroon/Congo” scores, such as the one below. Actually another Mexican with the greatest total African amount in my sample group (40%) also showed a predominant “Cameroon/Congo” score of 21% in addition to a minor “Southeastern Bantu” amount of 6% (above travelevel). Which could still indicate Angolan origins but probably moreso from the northern provinces where mostly Bakongo people reside (see also this map). This region is susceptible to wideranging interpretation. Despite the labeling i imagine it could rather imply Southwestern Bantu origins (Angola, interior Congo) for most Afro-descendants in the Americas. Even when other ancestral options also still remain possible. Eventhough obviously the total amount of African is quite minimal this Mexican person below shows one of the highest relative scores of “Southeastern Bantu”. It is about 71% (=5/7) within the African breakdown. I have seen several other Mexicans score similarly as well as Central Americans. It seems to corroborate the Angolan predominance within the African bloodlines of many Mexicans in accordance with documented history from the 1600’s. Even when much diluted it is still remarkable that this particular ancestral component can be pinpointed this way. Undoubtedly helped by the fact that additional African geneflow (from other regions and during later timeperiods) generally did not take place. This person is actually not of direct Mexican descent but someone whose family has lived in Texas for many generations. In my “Mexican” samplegroup i also included a few results from multigenerational Hispanos from New Mexico and Tejanos from Texas. Grouping them together with Mexican results was done purely for historical reasons and out of convenience, no other implications are intended. The minor African percentages often showing up for this group of people seems to demonstrate the dispersion of (heavily) diluted African bloodlines across the former territory of New Spain, incl. its northernmost areas. This African American result shows an astonishingly high level of “Southeastern Bantu”. I received this sample after having finished my survey of African American results (n=350). Within that sample group the highest score of “Southeastern Bantu” was merely 25% , with scores above 15% already being quite rare, indicative of a high degree of dilution. Instead this person seems to have preserved this particular lineage to a great extent. It is very fascinating to speculate which specific ethnic origins might be hinted at. As mentioned already southwestern Bantu connections should not be overlooked. But genuine Southeast African origins, and especially Malagasy ones also remain a theoretical possibility. Even when the share of Southeast Africa in documented Trans Atlantic Slave trade to the USA was rather minimal (below 2%). However it is probably telling that in virtually all Afro-Diaporean results i have seen the amount of “Southeastern Bantu” is never combined with any equally significant amounts of “Polynesian”, “Pacific Islander”or “East Asian”. Instead these proxies for the Austronesian genetic component among Malagasy people are only appearing at trace level if at all. As is also the case for the person below. 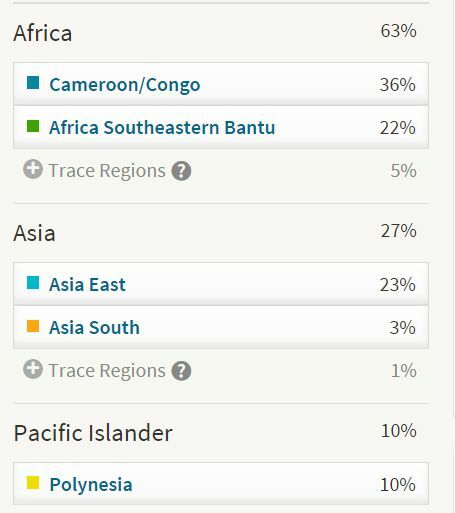 (see these results for an actual Malagasy person, also notice “Cameroon/Congo” is higher than “Southeastern Bantu”). 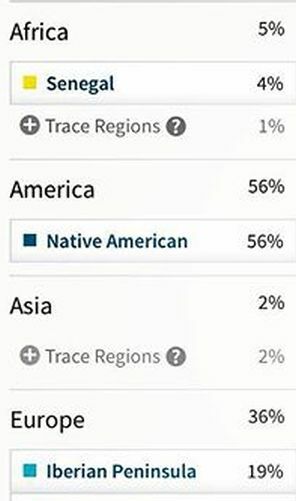 The 1% Polynesian might be “real” in fact and also to be traced back to a (single) Malagasy ancestor from somewhere in the late 1600’s/early 1700’s, as seems to be the case for many other African Americans who score small but “above noise level” %’s of Southeast Asian on 23andme. However it seems an additional explanation is needed for the far larger amount of “Southeastern Bantu”. This next screenshot might be more typical for the very small number of African Americans who show “Southeastern Bantu” as biggest region in their African breakdown. In my survey of 350 African Americans only 2 persons had “Southeastern Bantu” as number 1 region. But not convincingly so. In both cases the total amount not surpassing 20%, and with a very balanced breakdown otherwise, just like the one below. The Jamaican result below has “Southeastern Bantu” at the exact same level of 18%, as also obtained for the African American directly above. However “Ivory Coast/Ghana” is being shown as # 1 region and otherwise it is also a very balanced and diverse breakdown. Still this 18% “Southeastern Bantu” seems to be remarkably high for Jamaican standards (as observed sofar it is the highest score). It might very well be connected to either Angolan or interior Congolese origins. Notice also that no additional Asian or Pacific regions are being reported for this virtually 100% African descended Jamaican. The result below belongs to a person of Puerto Rican descent and possibly also with partial African American background. It shows one of the highest amounts of “Southeastern Bantu” in my survey, both unscaled and measured as a relative contribution within the African breakdown (22/53=41%). Intriguingly the “Southeastern Bantu” scores appear to be more significant for Puerto Ricans and Dominicans of relatively minor total African descent, as shown in the 2 results below. It seems to go in line with the documented early Angolan presence across the Hispanic Americas. Aside from showing the second highest “Southeastern Bantu” score for Dominicans this breakdown below is also noteworthy for only featuring 1 single Trace Region. Almost all Dominican results within my samplegroup tend to include nearly all African AncestryDNA regions available, either below or above tracelevel. Which made their group averages the most regionally balanced/diverse in my survey. Regrettably this is the only AncestryDNA result i have seen sofar of a Brazilian with significant African ancestry. Perhaps tellingly this person’s biggest African region is “Southeastern Bantu” which seems to fit perfectly with the large Angolan legacy across Brazil. However if this person’s family is from southern Brazil a (partial) ancestral connection to Mozambique could also be an option. The total amount of 17% “Southeastern Bantu” is already quite elevated when compared with what i have found among my sample groups. Even more so the relative score of almost 37% (17/46). Aside from the noticeable “Cameroon/Congo” score this Brazilian’s breakdown also seems to suggest considerable ancestry from Lower Guinea and more specifically the Bight of Benin. Which is also as expected as aside from Central Africa this area (incl. Yorubaland) is a major acknowledged source of African roots for Brazil. Still this only represents a single person’s African lineage. Undoubtedly Brazilians will also show a great deal of individual variation and diversity in their AncestryDNA results. Similar to the sample groups of my survey. Nonetheless, given a sufficient sample size, Brazilian group averages might likewise still roughly correspond with their documented African origins. This represents the number of results at the time of writing this blogpost, May 2016. The actual number of results is still increasing as this is an ongoing research effort. The 11 results (out of a total of 707 results) featuring 50%+ scores for just 1 single African region were: 50% “Senegal” for a Cape Verdean; 53%-50% “Ivory Coast/Ghana” for 3 Jamaicans; 51% “Benin/Togo” for a Haitian and 53% “Benin/Togo for a Jamaican; 57%-50% “Nigeria” scores for 5 African Americans. I have observed a couple more 50%+ scores among African Americans after finishing my survey (n=350). And also among 2 West Indians. Their screenshots can be seen in the last section. See also this chart for maximum individual scores. Quite likely Colombia and possibly also Peru, French Guyane as well as northern Brazil might have higher Senegambian ancestry levels than African Americans based on the Slave Voyages Database. Brazilians from Bahia might in fact be more Lower Guinean on average while many northern Brazilians (Amazonas, Pará, Maranhão) might show a biggest share for Upper Guinea going by slave trade statistics (see also this chart). For a recent assessment: Borucki, A. et al. (2015). Atlantic History and the Slave Trade to Spanish America. The American Historical Review, 120, (2), 433-461.